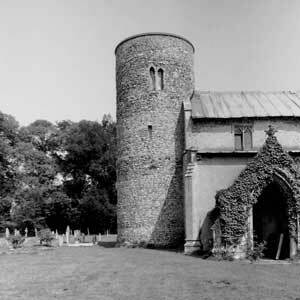 Churches with round towers are unusual: they are found mostly in East Anglia. 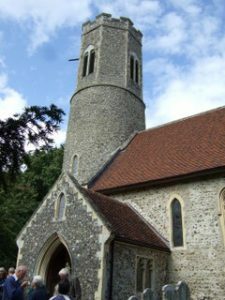 The Round Tower Churches Society (RTCS) was established in 1973 to help preserve these churches and to explore their origins and history. In its 40 years the Society has made grants of over £150,000 enabling us to support many of the English round tower churches. 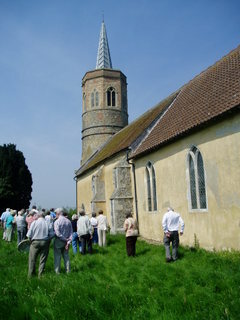 Support the Society and enable us to continue to provide grants for these churches. Join yourself or give a year’s membership to a friend- go to Society. 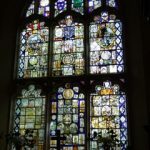 For information about recent grants and work in churches visit Grants. 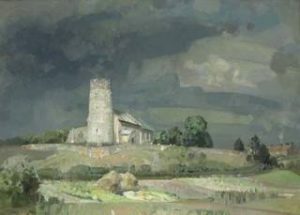 The Society publishes a quarterly magazine, organises visits to round tower churches in the summer months and sets up occasional study days. Information about the 2019 tours is now available. 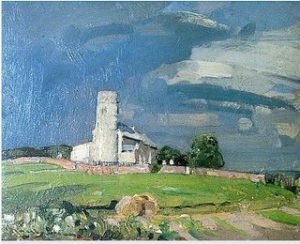 Stephen Hart, a leading authority on round tower churches, long time member and supporter of the Society and author of several books on church architecture died in 2014. For RTCS obituary and information go to Society News. 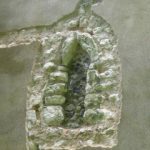 Some of Stephen’s analyses are being uploaded onto the website see Listing Round Tower Churches. 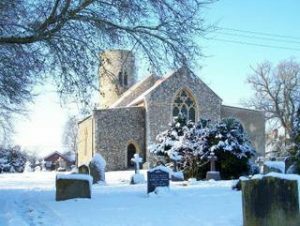 They include: Beachamwell, Beeston St Lawrence, Bexwell, East Lexham, Fishley, Fritton St Edmunds, Gayton Thorpe, Haddiscoe, Heckingham, Herringfleet, Morningthorpe, Potter Heigham, Thorpe next Haddiscoe, Welborne and many more . . . including Hales, above, a favourite with many people. 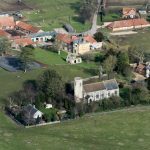 RTCS paid out two grants: £500 each to Haddiscoe and to Wissett for work completed in summer 2017. 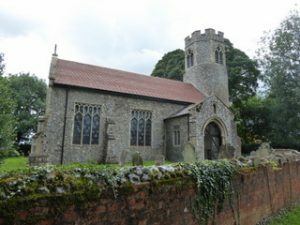 RTCS have promised support for eight other churches totalling £12,500. Some churches have begun their schemes. 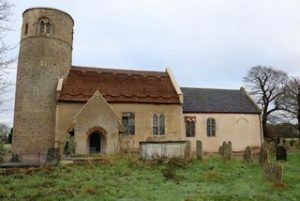 Herringfleet church is sheathed in plastic with a top hat of corrugated iron while work continues to repair plasterwork and to redecorate and re-lead and conserve the glazing in three windows. 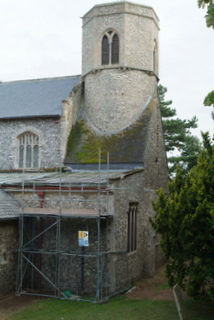 At Sustead work on Chancel roof is nearly finished. Threxton is replacing the chancel ceiling. 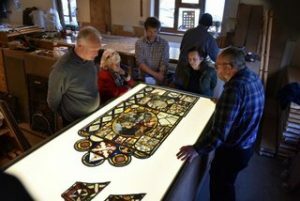 The work at Swainsthorpe is underway and is expected to finish before Christmas. 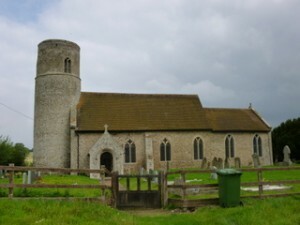 In addition RTCS supported the work of ‘Raise the Alarm’ to the tune of £2500 to install alarms on some of vulnerable Norfolk round tower churches. Donations were also made to the churches visited by the Society. In 2017-2018 this amounted to £735. The Roof Alarm Scheme was set up in August 2017. 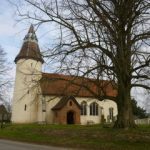 Over £250,000 has been allocated to install alarms in churches considered to be particularly vulnerable. 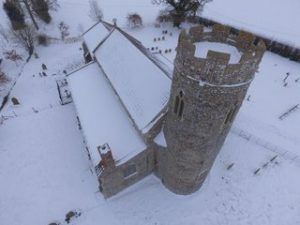 The money has been raised from Norfolk Churches Trust, Allchurches Trust and the Round Tower Churches Society working together with the Bishop of Norwich and Police and Crime Commissioner for Norfolk. 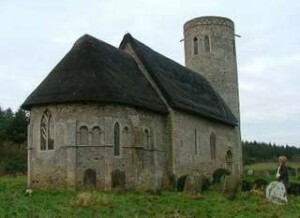 Birds making their nests have removed thatch reeds from the roofs of these churches. This has left gaps for the weather to get in. 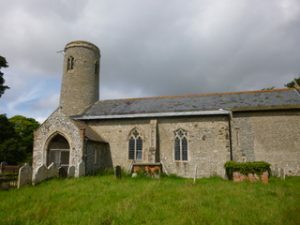 Churches Conservation Trust who have care of these churches are gathering funds to make the repairs which will be undertaken by Nick Walker, a local thatcher. CCT are nearly halfway to reaching their target. 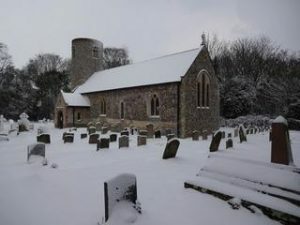 Bob Mitchell visited Herringfleet at the end of December 2018 and posted some photographs. 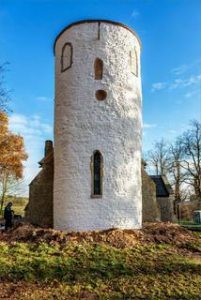 revealing a gleaming white tower with features revealed. Congratulations to Roy Tricker on being awarded the British Empire Medal for services to Heritage in Suffolk. 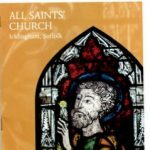 Roy is the author of a recent book Anglicans on High and countless excellent church guidebooks, two of which are illustrated. Roy will also be well known to those who attended RTCS study days for his talks, which manage to combine learning and humour. 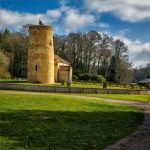 Three intrepid photographers braved the snow early in 2018: Wickmere by Jonathan Adams, Gunton by Richard Green and Fishley by Jeremy Dickson, while Michael Cant’s photograph shows Lamarsh in spring glory before the snow. 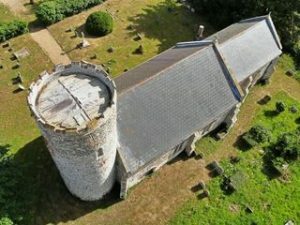 A fine aerial photograph of East Walton in its setting by John Fielding. Hardley. 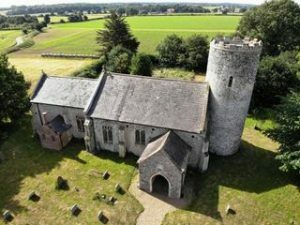 Bob Mitchell was out with his drone today (July 2nd 2018) and has sent us three wonderful photographs. 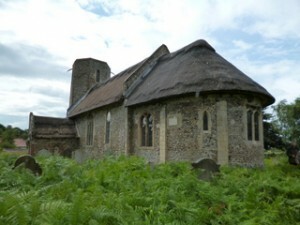 St Margaret’s Hales and St Gregory’s Heckingham are two Churches Conservation Trust churches in Norfolk that share the same problem: the removal of thatch reeds from the roofs by errant birds making their nests has left gaps for the weather to get in. 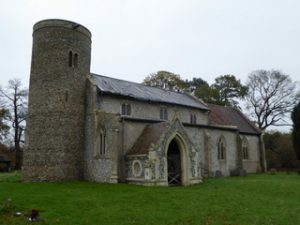 Both churches are tucked away from active communities, but CCT staff have been working with local people to gather funds in order to make the repairs, which are to be carried out by local thatcher Nick Walker. CCT are nearly half way to reaching their target. If you would like to donate to the project, please text ‘HALES’ or ‘HECKHAM’ to 70191 to donate £10, or you can donate via visitchurches.org.uk. 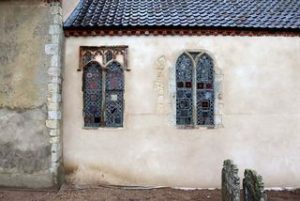 Thwaite (left) and Merton (middle) had lead stolen from their roofs. RTCS helped Intwood (right) with replacement and repairs to the lead. 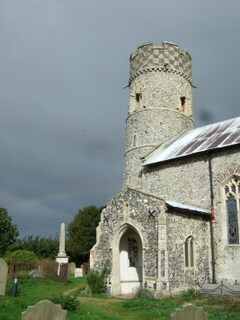 A great photo of Gissing (left) by Liz Barrett. When was it taken? And what were the children doing outside the church? 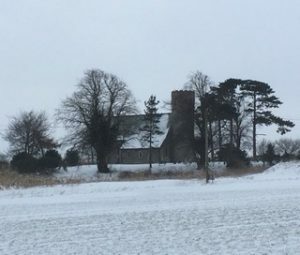 Right – Gissing in the snow. 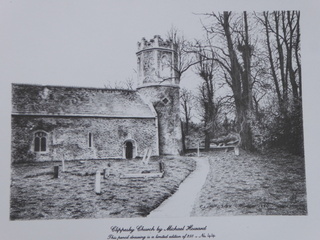 Many thanks to Clippesby who donated a drawing of the church (left) in thanks for our support for their repairs. 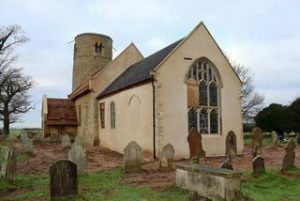 Threxton have been awarded funding for the development stage of their repair project. RTCS are helping them with a grant. 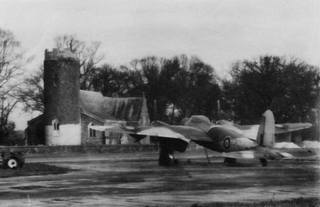 Bill Goode’s archive is currently held at Lowestoft but is to move soon to Ipswich. 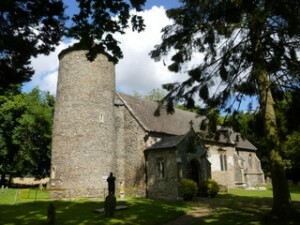 HLF Heritage Lottery Fund. HFL are consulting about the future of their funding. The amount of money they have to allocate is getting less as people buy fewer lottery tickets. 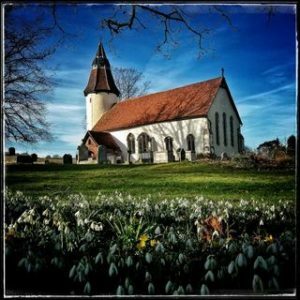 The ring fenced funding for churches and other places of worship is coming to an end and churches will be competing with other demands for their support. 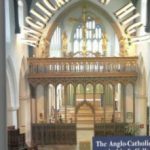 This is a worry for charities such as ours which are concerned with ensuring the upkeep of churches and the important role they play in the life of their local communities. 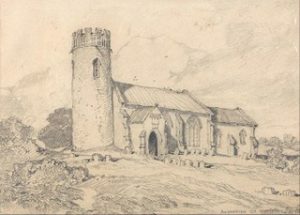 Three photos sent to RTCS – the first of John Sell Cotman’s graphite and wash sketch of Aylmerton (early 1800’s) and two paintings of Haddiscoe by Sir John Arnesby Brown (1866 – 1955). 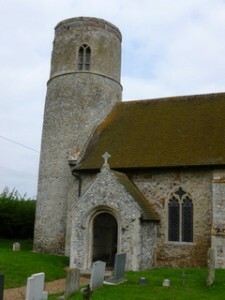 The artist lived at Haddiscoe and is buried in the churchyard. 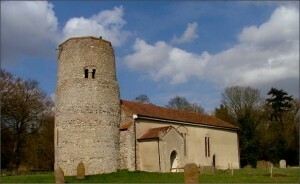 Gisleham church. 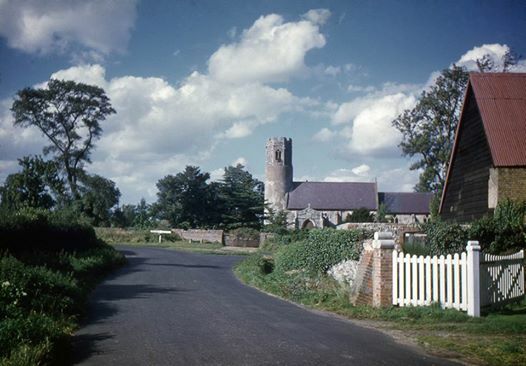 This photo of Holy Trinity, Gisleham (left) was taken around 1953 by Hardwicke Knight, a famous NZ photographer. Thanks to Dave Murray who lives in NZ. 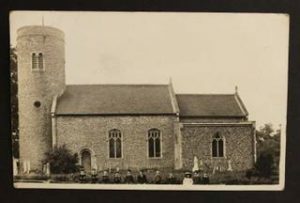 He scanned it from a Kodachrome slide in his collection and placed it on the Round Tower Churches Facebook page. 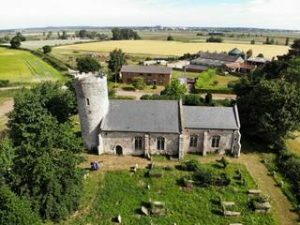 Digging Sedgeford: A people’s archaeology has a fascinating chapter about St Mary’s Sedgeford (right) and another – power and piety in Medieval Sedgeford – which considers the evidence for an earlier Saxon church with burials discovered as part of the excavations. Digging Sedgeford is written by the SHARP Team and published by Poppyland Publishing. 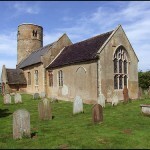 Shire Books have recently reprinted: Medieval Church and Churchyard Monuments by Sally Badham. 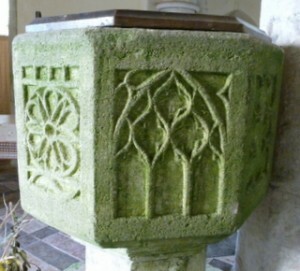 Sally starts her book with the words ‘Churches contain much of the most interesting medieval sculpture in Britain’. The book is a delight with great photos. 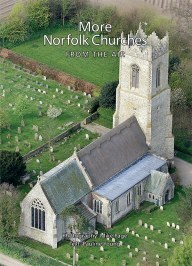 Mike Page and Pauline Young have just published ‘More Norfolk Churches from the Air’. 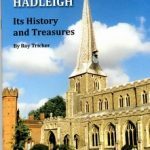 This fine collection includes Bessingham, Bradwell and many more Round Tower Churches. All profits from the sale of the book go to cancer charities.